The Prickly Pear quilt block must be so named because of all the points along the edge of the block. These "points" are created using half square triangles to achieve the effect. 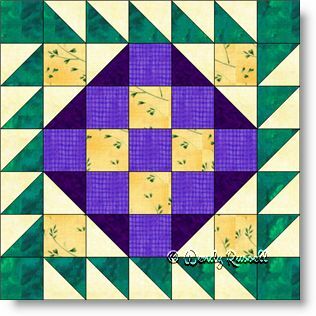 In fact, half square triangles and squares are all that is needed to make this quilt block. Any difficulty arises if you are not precise in sewing an accurate quarter inch seam allowance for all the patches, and for that reason only, I have added this block to the Intermediate level of difficulty. I chose to construct this seven patch quilt block in the manner of an uneven nine patch, rather than in seven separate rows, as I find that an easier method. However, don't be deterred if row by row is your preference for the construction. The sample quilts illustrated give you ideas of options for making your special quilt for a totally different look than a friend's.